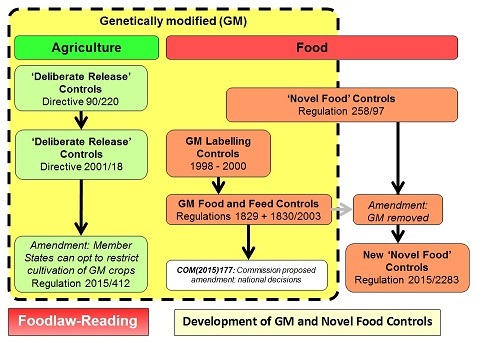 Controls for 'novel foods' were first proposed as part of the 'Internal Market' programme in the early 1990s. Regulation 258/97 was eventually adopted in January 1997 and came into effect on the 15 May 1997. The date of 15 May 1997 has become important since any food or food ingredient commercially available in the EU prior to that date is not considered 'novel'. 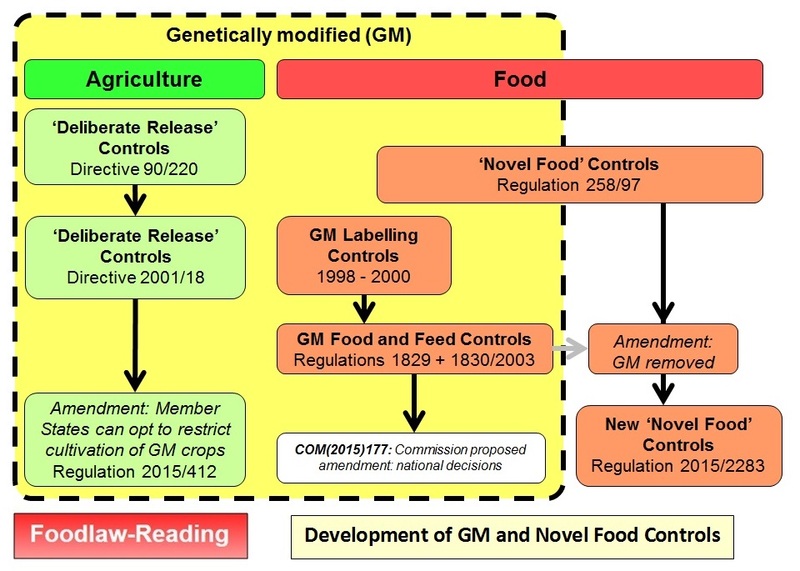 The original regulation covered genetically modified foods and food ingredients - categories (a) and (b) above. These were however deleted when more detailed controls for GM foods were adopted in 2003. Regulation 258/97 required 'novel foods' to be subject to a risk assessment prior to their sale and use. This involved an initial assessment by a Member State and, in the event of an objection by another Member State to the initial assessment, a subsequent assessment by the European Food Safety Authority (EFSA). A significant number of novel foods were approved by this route and permitted by the adoption of Commission Regulations. Concerns were however raised by countries outside the EU that the Regulation created excessive barriers to foods which were common in other countries but which had not been commercially available within the EU prior to the 15 May 1997. The EU therefore agreed to amend and update the legislation. The initial Commission proposal (COM(2002)0872) proved controversial in that it included procedures for the authorisation of nanotechnology and animal cloning in food production and, following a failed conciliation process, the proposal was not adopted. A subsequent proposal (COM(2013)0894), without the animal cloning element, was agreed and became Regulation 20015/2283. An extended definition of 'novel food' is included - see Article 3(2). All risk assessments are now conducted by EFSA and a simplified route provides for the approval of 'traditional foods from third countries'. All approved novel foods now appear in an official EU List published as Regulation 2017/2470 (as amended). For an on-line 'Novel Food Catalogue', see the Commission's page: Novel Food Catalogue. A copy of the guidance published by EFSA in February 2018 can be downloaded from Wiley online publications (click on image). A copy of the guidance published by EFSA in November 2016 can be downloaded from Wiley online publications (click on image). Information and Guidance Document "Human Consumption to a Significant Degree"
This Commission publication relates to the original Regulation 258/97 but as it is still provided on the Commission website it can be used to assist in the interpretation of the new Regulation (click on image). 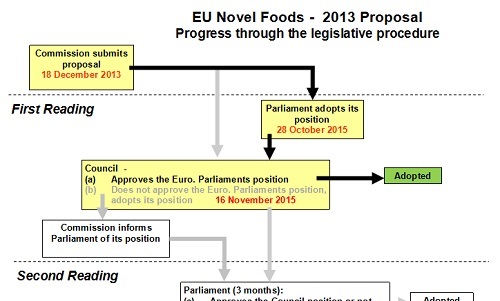 In December 2007 the Commission adotped a proposal for updating the novel food legislation. This was published in January 2008. However there was no agreement between the Institutions - particularly the Council and the European Parliament. Ultimately, despite conciliation, the proposal was not adopted and lapsed in March 2011. The main areas of disagreement related to nanotechnology and animal cloning. The Commission published revised proposals in December 2013. This included one which would replace the original novel food regulation and two others specifically on animal cloning. Although there has been little progress on the issue of animal cloning, the revised regulation on novel foods was adopted in November 2015. This figure shows the EU procedure for adopting legislation. The coloured items refer to stages which were followed. It can be seen that in March 2011, the discussions concluded without the adoption of new controls. The work ceased and the Commission had to bring forward new proposals to start the whole procedure again.